The ADS1244 is a 24-bit, delta-sigma Analog-to-Digital (A/D) converter. It offers excellent performance and very low power in an MSOP-10 package and is well suited for demanding high-resolution measurements, especially in portable and other space- and power-constrained systems. 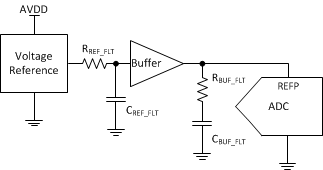 A 3rd-order delta-sigma modulator and digital filter form the basis of the A/D converter. The analog modulator has a ±5V differential input range. The digital filter rejects both 50Hz and 60Hz signals, completely settles in one cycle, and outputs data at 15 samples per second. A simple, 2-wire serial interface provides all the necessary control. Data retrieval, self-calibration, and Sleep Mode are handled with a few simple waveforms. When only single conversions are needed, the ADS1244 can be shut down (Sleep Mode) while idle between measurements to dramatically reduce the overall power dissipation. Multiple ADS1244s can be connected together to create a synchronously sampling multichannel measurement system. The ADS1244 is designed to easily connect to microcontrollers, such as the MSP430. The ADS1244 supports 2.5V to 5.25V analog supplies and 1.8V to 3.6V digital supplies. Power is typically less than 270uW in normal operation and less than 1uW during Sleep Mode.